1950’s Bensonhurst, A Cornucopia Of Diverse, Ethnic Foods… Not really! It’s almost Saint Patrick’s Day and the Irish soda bread is already flowing like wine. It’s their version of Panettone, I guess. Although we ate Italian food almost exclusively growing up, there was always room for trying other ethnic foods as they came up in the season. Saint Patrick’s Day was the first ethnic holiday in March. My mother would bring home Irish soda bread with her grocery. We would smear butter over the slices and enjoy it with a cup of hot coffee. In my neighborhood non of the Italian bakeries made Irish soda bread but you could usually pick up a loaf in the supermarkets. And then the time came when my mother cooked her corned beef and cabbage and boiled potatoes. It was the one time of year we would eat that. It was like having turkey on Thanksgiving, but a lot more bland. Nothing a heaping tablespoon of Gulden’s spicy brown mustard couldn’t fix. I’m sure our Irish friends loved this meal they grew up eating. I hated boiled potatoes! I never got it. Why not crisp them up a bit with a little butter or olive oil? Slice and roast them with garlic and herbs. But boiled? Sorry. And then, just boiling the meat and the cabbage? Glad this meal only came once a year. What we did for Saint Patrick. I hope he appreciated it. During the Passover season my grandfather would bring home boxes of Matzo. Now, I never realized the religious significance of Matzo. I just enjoyed eating the cracker along with my grandfather with a nice helping of butter spread over the top to help it go down. Every once in a while I would add some grape jelly. But most of the time we ate it with just butter. We would eat Matzo sometimes in the morning for a quick breakfast or sometimes as a snack at night. Till this day I buy a box of Matzo around Passover and enjoy it. We had a number of Jewish Delis around the neighborhood. I remember a place on 86th Street under the El. It was called Hy Tulip. Great Kosher Deli in the 70’s and 80’s. I remember a place around 4th Avenue, not sure of the street. The waiters were all old Jewish men with white aprons that were up to their armpits and extended down to their shins. My mother would always order me a Kosher hot dog and knish. I loved the snap of those hot dogs with the deli mustard and sauerkraut. Washed it all down with a Dr Brown’s cream or cherry soda. Being we were Italian, we never went out to eat in an Italian Restaurant. Why would we? I think I was 17 when I ate in my first Italian Restaurant. Pizzerias not included. Back then they only served pizza and calzones, sometimes zeppoles. If they ever did serve other Italian food, we never bothered with it. I was 40 years old before I ate anything other than Pizza and spumoni at L&B’s Spumoni Gardens. We just never did. Chinese food was the staple for going out to eat. After all, we had no idea how to prepare that food. Chinese food for us only consisted of Won Ton soup and Chicken Chow Mein, occasionally an egg roll. That was it. My mother and father never varied from that comfort zone. Mexican food? Never heard of it. We used to have a candy called Hot Tamales, but we had no idea what Mexican food was. First time I had mexican food was when I was about 11 years old. We were on a trip to California to visit my Aunt and Uncle and cousins. 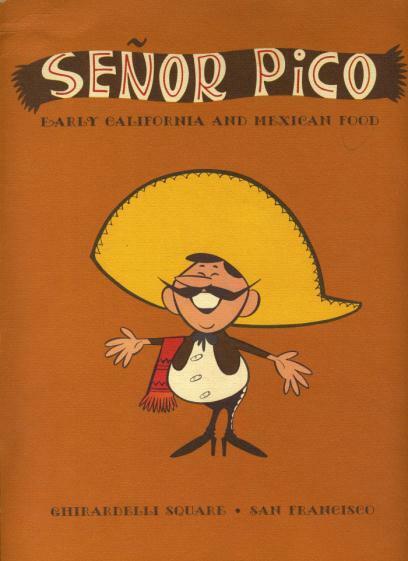 Senior Pico was the name of the place they took us to in San Fransisco. I remember getting a ceramic parrot on a stick in our drinks. Well, not my drink. I think you had to order the “Potted Parrot” in order to get one. Might still have one put away somewhere. You just don’t get rid of a ceramic parrot on a stick. Good barbecue growing up in Bensonhurst during the 50’s and 60’s was Italian sausage grilled on the back yard BBQ over the hot coals. Italian marinated chicken on the bone was a close second. Don’t think we ever barbecued ribs back then. My grandfather used to consider that “junk meat” and used the bones in my grandma’s tomato sauce occasionally. Japanese food? Are you kidding? Never heard of it. Chinese was our exotic asian food. Till this day I could not get my family to eat sushi. Me and my boys love the stuff. French, German, Greek? We had no clue. I remember when my sister was a teenager she had a girlfriend who was Greek. I could remember her telling my parents how wonderful her family was, just like us, enjoying good food and partying. Indian, Tai food? Sorry, it was non existent when I was growing up. And if it was, it was not in our neighborhood. 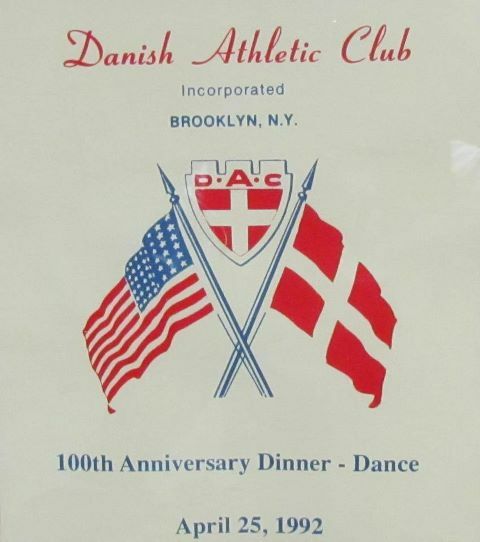 I do remember my parents taking us out to eat on a couple of occasions to the Danish Athletic Club on 65th Street and 7th Avenue in the Sunset Park neighborhood. Brooklyn had a large Norwegian population at one time in the Sunset Park area of the borough. Nestled among the auto body shops on 65th Street was this social club of sorts that offered dining to outside guests. I don’t ever remember a menu, but I believe we used to get soup or salad, entrée, desert and coffee for one low price. The entrees varied depending on the day. I remember a band playing when we went and it was almost like being at a wedding. It was a large hall with tables set all around and a large dance floor in the middle. That was my exposure to Danish food, drink and music all rolled into one. They are still around today, after over 120 years in existence. They even have a Facebook page! That’s progress. As an adult I made up for lost time and enjoyed introducing my parents to other cuisines of the world. It was something they would have never ventured to on their own. I remember taking them to a Chinese Restaurant up here in Rockland County and ordering everything on the menu except wonton soup and Chicken Chow Mein. Some hit but many missed. It’s hard to teach an old dog new tricks. But I give them credit for at least trying. I for one am glad I have experienced other cultures and their food. But no matter how delicious that other food is, it’s always nice to come home to good old Mama’s and Grandma’s Italian home cooking. Bon Appetite! Cut about 1 inch off the ends of the broccoli rabe. Discard the tough, woody pieces. Wash the broccoli rabe well in cool water. Allow to drain in a colander, leaving the water that clings to the leaves. 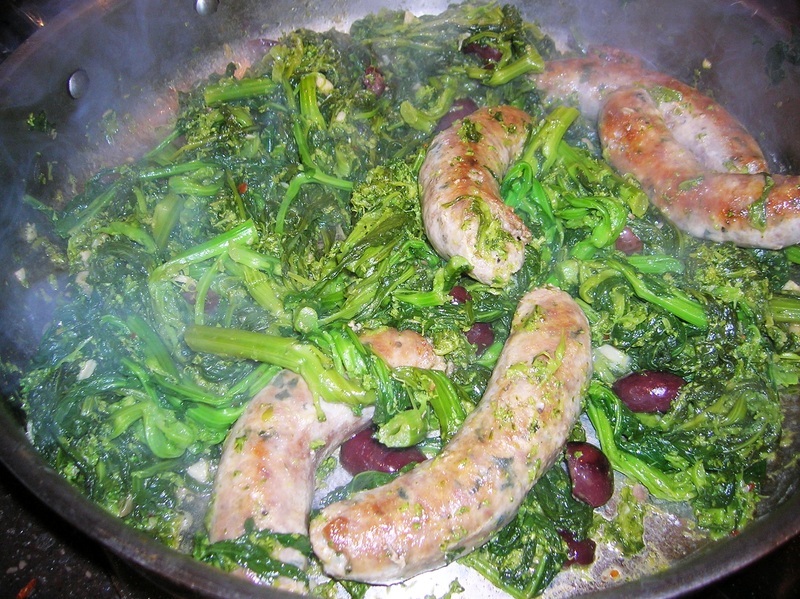 In a large saute pan, heat 1 tablespoon of olive oil and 1/2 cup of water and add the sausage. 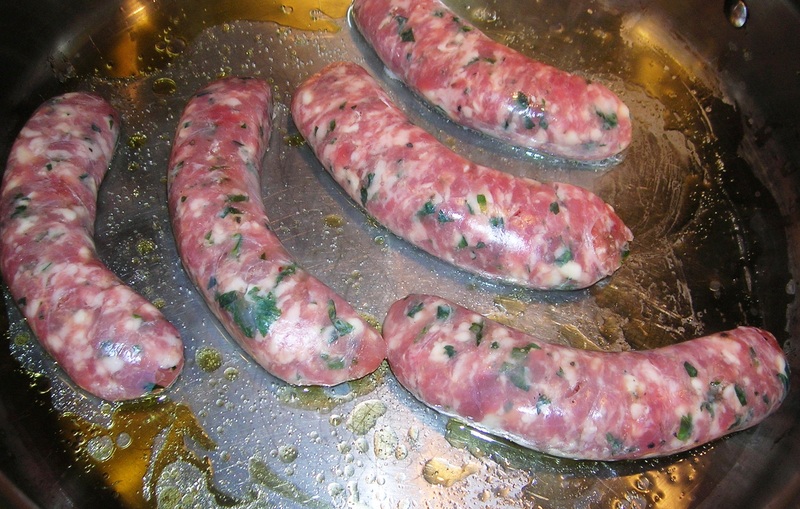 Poke a few holes in the sausage with your fork or knife and cover. Cook over moderate heat till the water evaporates, about 8 minutes. Uncover the pan and continue cooking until the sausage is browned on all sides, about another 6 minutes. Remove the sausage to a plate and cover to keep warm. Drain the fat from the pan without cleaning the pan. Pour in 1/4 cup olive oil. Add the chopped garlic and hot pepper flakes. Cook until the garlic is golden, about 2 minutes. Add the broccoli rabe, season with salt. Pour in 1/2 cup of water, bring to a boil over medium high heat and cover. Steam the broccoli rabe for 6 minutes, until softened. Uncover and add the olives. Cook over medium heat until the liquid evaporates, about 5 more minutes. The broccoli rabe should be soft and tender at this point. 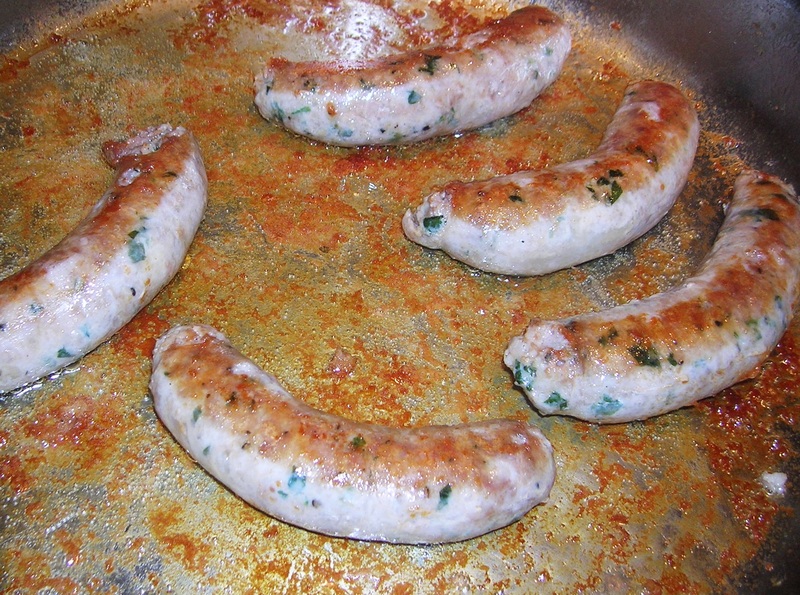 Return the sausages to the skillet and turn them until warmed through. 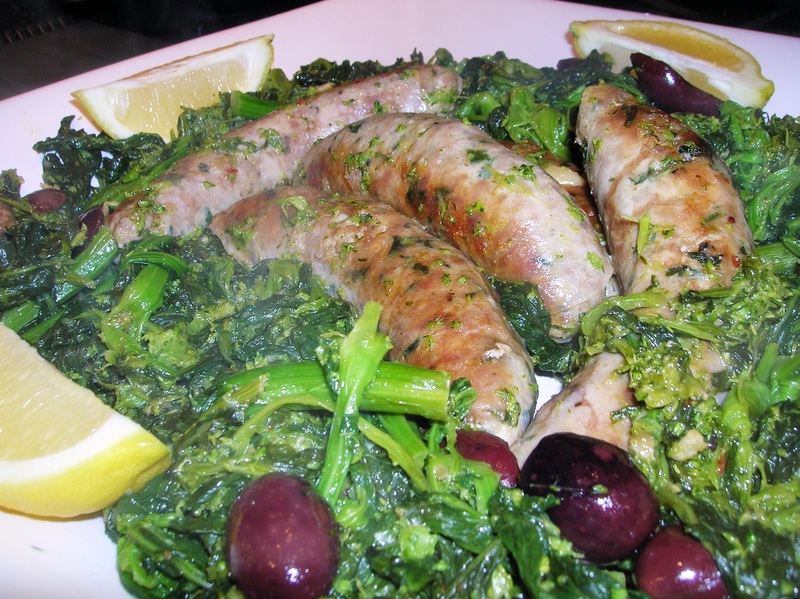 Serve the sausages on a platter with the broccoli rabe and some lemon wedges. Crusty Italian bread is NOT optional! 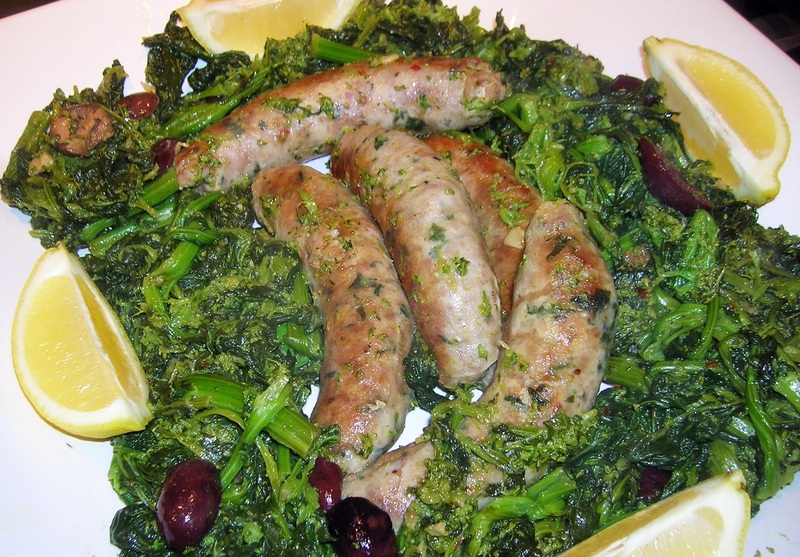 This entry was posted in Pork and tagged broccoli rabe and Italian sausage, Danish Athletic Club, ethnic food. Bookmark the permalink. Thanks again for enriching our days with your memories… and making us drool with your recipes. Marianna, how could you not find Rabe? It’s as common as ice berg lettuce. Hope you enjoy it! I love these recipes! But I truly love the stories that come with them! My parents are from Abbruzzi and my mom cooked comfort meals like this for my dad and 10 kids! Please keep the recipes and stories coming because I love to read them. Thanks for a wonderful website! Thank you Linda for your kind words!